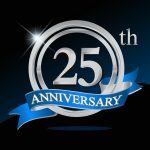 For a quarter-century AT Forum has served as a source of support and encouragement for the opioid addiction community, as well as an advocate of medication-assisted treatment (MAT) and opioid treatment programs (OTPs). Much has changed during that time, and some things have come full circle. Back in the early 1990s, methadone was the only medication for treating opioid use disorders (OUDs). The opioid of choice among users was heroin, and most heroin users were living in urban areas. The first issue of AT Forum noted that the typical upper daily limits of methadone at some OTPs were only 20 to 60 mg; many patients require higher doses. OTPs often worked in isolation, and they felt it keenly. A treatment that had been a scientific breakthrough in the 1960s now had few supporters. Program staff members, their patients, policy makers, and the media sorely needed reliable information. AT Forum stepped in to help meet that need. The first issue of the AT Forum newsletter offered a mix of patient advocacy, management guidance, news updates, and research articles—as the newsletter does today. Susan Emerson—publisher of Addiction Treatment Forum (atforum.com) throughout its lifespan—recalls those early days. Ms. Emerson remembers the stories that had an impact. Some involved persistent stigma and NIMBY (Not in My Back Yard); others showed progress being made in treating OUDs. But what stands out most in her memory is the difference the publication made in peoples’ lives. In 1995, AT Forum featured an interview with Vincent Dole, MD, one of the developers of methadone maintenance treatment (MMT). It was now 30 years after Dr. Dole, Marie Nyswander, MD, and Mary Jeanne Kreek, MD, first published their research showing the effectiveness of methadone treatment. An important shift occurred in the mid-1990s: more heroin users chose a prescription product, instead of heroin, for their first opioid use. 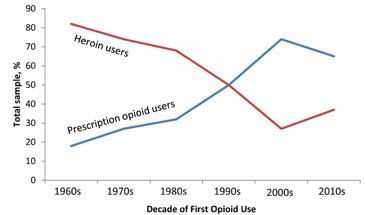 As the graph below shows, heroin use continued in a downtrend, and prescription opioids in an uptrend, until the 2000s, when a reversal began. Not shown in the figure: the lines crossed again in 2017, as heroin became once again the opioid of choice. Adapted from Cicero TJ, Ellis MS, Surratt HL, Kurtz SP. The changing face of heroin use in the United States: A retrospective analysis of the past 50 years. JAMA Psychiatry. 2014;71(7):821-826. doi: 10.1001/jamapsychiatry.2014.366. Published online May 28, 2014. Much has changed since AT Forum was introduced 25 years ago. Today, opioid-related deaths are reaching new highs. News about the escalating opioid crisis dominates media outlets—from newspapers to consumer magazines to broadcast media. Signs of progress. Along with the troubling news of increased heroin use, signs of progress have appeared along the way. Among them: Providers, government officials, corporate partners, and patient advocates have joined together to form a stronger community. In the treatment area, a choice of three medications gives health care providers options for treating OUDs. A fourth medication, naloxone, for treating opioid overdose, is now available without a prescription in many states, and has saved countless lives. Today’s AT Forum articles cover topics such as these, as well as offering advice on other key aspects of addiction treatment—siting new facilities, adjusting drug therapy to conform to individual patients’ requirements, and meeting adolescents’ urgent needs for treatment programs, to name a few. Speculation calls for yet another change ahead in the opioid addiction community—a shift from heroin to fentanyl, carfentanil, and an opioid known as U-47700—as the upcoming choices of opioids of first use. Indications are that it’s quite likely to happen. And if it does, AT Forum will be there to cover the news. Funded by an unrestricted educational grant from Mallinckrodt Pharmaceuticals ever since its inception a quarter-century ago, AT Forum has published 300 news updates and nearly 100 newsletters. It’s Official: Heroin Is Once Again More Popular Than Rx Opioids. AT Forum. October 24, 2017. Cicero TJ, Ellis MS, Surratt HL, Kurtz SP. The changing face of heroin use in the United States: A retrospective analysis of the past 50 years. JAMA Psychiatry. 2014;71(7):821-826. doi:10.1001/jamapsychiatry.2014.366. Published online May 28, 2014. Madras BK. The surge of opioid use, addiction, and overdoses: Responsibility and response of the US health care system [editorial]. JAMA Psychiatry. 2017;74(5):441-442. doi:10.1001/jamapsychiatry.2017.0163. Published online March 29, 2017. Martins SS, Sarvet A, Santaella-Tenorio J, Saha T, Grant BF, Hasin DS. Changes in US lifetime heroin use and heroin use disorder prevalence from the 2001-2002 to 2012-2013 National Epidemiologic Survey on Alcohol and Related Conditions. JAMA Psychiatry. 2017;74(5):445-455. doi:10.1001/jamapsychiatry.2017.0113. Published online March 29, 2017. To browse archived issues on the AT Forum website, go to http://atforum.com/newsletter-archives/.